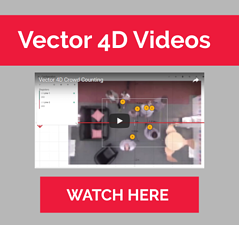 The Irisys Vector 4D™ is the most advanced people counter available in the world with unrivaled count accuracy. Impressive features such as passive staff detection, dwell time measuring and the ability to connect multiple units to cover wide openings enable this IoT device to help smart retailers go beyond people counting and optimise their customer experience. The device emits invisible infrared light, which illuminates the scene below. Reflected light is detected and the time taken for it to return is used to identify people from objects and track their movements.